February 11, 2019 | USA: Phoenix AZ | Source: Republic Services, Inc.
Republic Services, Inc., the second largest waste collection services provider in the United States and a leader in the use of natural gas refuse vehicles, has signed up for more renewable natural gas from Clean Energy Fuels Corp.
Republic Services says the agreement represents the widest geographic usage of Clean Energy Redeem™ renewable natural gas (RNG) in North America. RNG is an ultra-low-carbon intensity transportation fuel that substantially lowers greenhouse gas emissions. 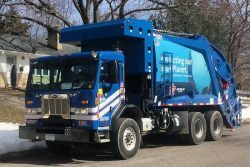 A growing number of Republic Services’ natural gas-powered vehicles will utilize increasing amounts of Redeem fuel across 21 states over the next five years. This is projected to reduce fleet emissions by roughly 250,000 metric tons of CO2e (carbon dioxide equivalent) per year, which is equal to taking 53,000 passenger vehicles off the road (according to the U.S. Environmental Protection Agency (EPA) emissions calculator). For more information about Redeem, visit www.CleanEnergyFuels.com.